The summer has been whizzing by and it hasn't been without its share of adventures! My most favorite meal was probably at Nobu Next Door, where we tasted melt-in-your-mouth tempura, had fresh, delicious sashimi, and an excellent chocolate souffle/mousse. 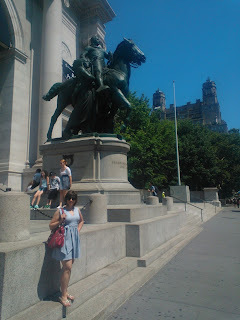 We visited the Metropolitan Museum of Art (easily my favorite, I could look at ancient Greek urns for days, apparently), the MOMA, the Museum of Natural History, the Guggenheim, and of course all the touristy things like Central Park, the Empire State Building (we went for sunset, very pretty), and Staten Island/The Statue of Liberty. On the roof of the Met with my sister Anthea. Sadly, no patio cafe to be found. 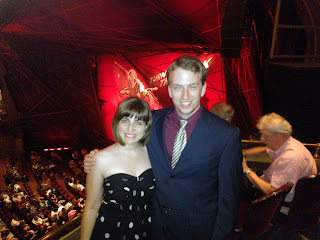 Finally, of course we had to go to a Broadway show. What better than "Spiderman, Turn Off the Dark" - a show that has made headlines in more than one way. The show was pretty entertaining - although I wouldn't call it a critical hit. We really enjoyed it, all in all.